The solid, or underlying geology in Wingfield is known as gault formation, a sedimentary rock formed approximately 99 to 112 million years ago in the warm, shallow seas of the Cretaceous Period. The superficial geology is mostly till – a diamicton formed up to 2 million years ago in the ice age conditions of the Quarternary Period. The hamlet is quite high by Bedfordshire standards and on something of a plateau, the area around Pond Farm being 445 feet above sea-level. The derivation of the name is uncertain. “Wina’s field” with Wina being an Anglo-Saxon personal name seems unlikely given the early forms of the name, for which see below. The first element may be “wince” meaning a nook of corner, as the hamlets is on a plateau at the head of a small valley. Perhaps the best suggestion is “Winta’s field”, Winta being a personal name. 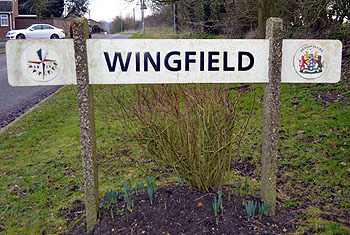 Wingfield has always been a hamlet of the ancient parish of Chalgrave. It is not mentioned in the Domesday Book of 1086 though a Manor of Wingfield emerged in the 14th century from holdings which can be traced back into the previous century. As a young boy I can remember watching that sign being erected by the council workmen 1951 I believe. A bit of forgotten history from the war years. As you face Dunstable from the top of Lords Hill, take the lane on your left, their is or used to be a large oak tree on the right hand side of the lane, as recollections serve opposite or nearly opposite a field entrance on the left hand side. There is or used to be a field entrance by the oak tree into the field overlooking the countryside towards Dunstable, a short way into this field probably a few hundred yards in, almost but not quite a straight line, (as memory serves right ish). but a long time ago so I could be wrong. Under the field at this point is or was an observation post. As a young boy probably no more than 7-8 years old (1952/3) I remember lifting the lid on what looked like an large drain standing proud, inside was a ladder leading down a few feet into an area which still contained the wireless set etc, it looked as if it could be used again very quickly if needed. I did not linger long as it looked as if the soldiers could be back any time soon. (To anyone reading this and thinking what would an 7-8 year old be doing out and about on his own, the world then was a very different place children became independant very quickly.) I explored this place a few times but it wasn’t that interesting to a young boy and then one day when as luck would have it I happened to be their, some workmen came, they took away the top ie. the sticking up drain cover type thing, flattened the field over the place so that you can not tell that their is anything their or ever was. I tried speaking to the workmen but very unusually for that day and age and given the fact I was the only other person there they were quite remote and did not want to speak at all with me, it was as if they would have prefered no one to see what they were doing. They did not tell me to leave so I watched what they did expecting they would remove the equipment from the interior, as far as I could tell they left everything inside just made sure the entrance was blocked and untracable, returning the field to how it is today. If anyone in the parish has a metal detector it might be possible to refind this piece of local history,good hunting to anybody that tries.